September 8, 2010 - The Federal Aviation Administration (FAA) has selected IFS Applications as its supply chain and maintenance repair and overhaul (MRO) solution to ensure reliability of equipment used throughout the U.S. National Airspace System (NAS). Lockheed Martin will be the system integrator in support of the FAA program called the Logistics Center Support System (LCSS). The NAS is one of the most complex aviation systems in the world ? enabling an average of 50,000 flights per day in the United States and over much of the world's oceans. The NAS encompasses 14,500 air traffic controllers, 4,500 aviation safety inspectors, and 5,800 technicians. It includes more than 19,000 airports and 600 air traffic control facilities. In all, there are 41,000 NAS operational facilities. In addition, there are over 71,000 pieces of equipment to maintain, ranging from radar systems to communication relay stations. The LCSS solution replaces the FAA?s existing Logistics and Inventory System in use at the Federal Aviation Administration Logistics Center (FAALC), a distribution, warehousing and repair facility housed at the Mike Monroney Aeronautical Center in Oklahoma City. 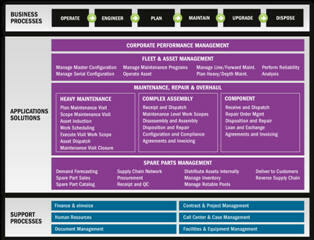 ?IFS is recognized as a world leader in MRO functionality in the aerospace and defense industry worldwide,? IFS North America President and CEO Cindy Jaudon said. ?But there is a special pride that comes from knowing that as our friends, family, customers, and employees travel throughout North America, IFS Applications is running behind the scenes as a best-in-class MRO solution, helping to ensure that this nation?s transportation infrastructure is operational.? Aerospace and defense is one of IFS? targeted market segments. IFS Applications provides market leading off-the-shelf component based solutions that support Performance Based Logistics (PBL), Contractor Logistics Support (CLS), and Fleet Operator programs; and solutions for Maintenance Repair and Overhaul (MRO), Asset & Fleet Management, Supply Chain Management and Product Lifecycle Management. IFS customers include the United States, British and Norwegian defense organizations as well as the Eurofighter consortium?commercial MRO shops and service operators include Bristow Helicopters, Aero-Dienst GmbH, K&L Microwave, Hawker Pacific, Ensign Bickford, Todd Pacific Shipyards and Jet Turbine Services. In addition, IFS provides solutions to original equipment manufacturers (OEMs) such as General Dynamics, Lockheed Martin, BAE SYSTEMS, SAAB Aerosystems, and GE Aircraft Engines. IFS is a public company founded in 1983 that develops, supplies, and implements IFS Applications, a fully-integrated, component-based extended ERP suite built on SOA technology. The company has more than 2,000 customers in more than 50 countries and focuses on seven main industries: aerospace & defense, utilities & telecom, manufacturing, process industries, automotive, retail & wholesale distribution, and construction contracting & service management.